June 16th and a new era started at the Nack 5 as Zdenko Verdenik took over the managerial reins of Omiya Ardija from Jun Suzuki. His first test as Ardija coach would be to welcome the defending champions to our stadium, which would prove no easy task. The Slovenian coach must have hoped he could start by plugging a leaky defence, which had already let in 22 goals before the start of this game. Even though Verdenik afterwards might be able to find some praise for a spirited fightback, in truth the Squirrels were again outclassed by the opposition and Reysol won in commanding style to push themselves back into the top half of the league. Squirrels fans arrived at Nack 5 hoping for the perennial boost teams tend to get when under a new coach. This duly arrived in the 9th minute with a strike from Brazilian exile Carlinhos, who has been one of the few bright sparks in a dim season for Ardija. Despite this positive opening, Ardija could not build on it and in the space of 15 first half minutes Reysol completely turned the match around and opened up what would become an unassailable lead. The equalizer through Leandro Domingues was an absolute stunner, and is no doubt a contender for goal of the season. Leandro demonstrated his masterful touch and finishing from the edge of Ardija's penalty box. Reysol followed this up with goals from Wagner and Kudo and the Squirrels trudged off at half time with their heads bowed and with Verdenik's hopes of an opening win looking very forlorn. The second half started in the worst possible way for Omiya with a 46th minute 4th goal for Reysol and a second goal for Kudo. Reysol now were flying and fans must have feared for our defence, but the players put in a shift to keep Reysol out and set up some scoring chances of our own, one of which Cho took on the 58th minute. Ardija would go on to miss chances that looked easier to score and after the referee blew the whistle to confirm Reysol's 4-2 win, Carlinhos, arguably our best player this season, could be seen deep in conversation with his fellow Brazilian, Rafael. One can quite imagine that Carlinhos is wondering where he has ended up, playing in front of a defence that has three times this season let in 4 goals and with a strike force firing blanks. I can only hope that he will remain to help Ardija in their fight to stay in J1. As Squirrels fans made their way out of Nack 5 their minds would have turned to two results on this day which could prove key. Gamba Osaka continued their poor form with a 2-1 loss at home to our neighbors Urawa Reds. Yet again Osaka let a late goal in to throw away a point. Their dismal run of form might help Ardija to stay in the J1. However our other main rival for a relegation place, Albirex Nigata, managed a major surprise with a home 1-0 win over high flying S Pulse. 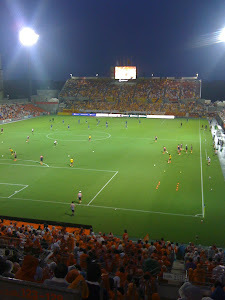 Inevitably, Shimizu had most of the possession in this match but failed to score, whilst Albirex scored with their first chance to put them only 3 points behind Ardija. It is distressing to have to rely on other results to stay out of the relegation zone and I am sure that Mr Verdenik will be looking to urge the players on to putting our fate in our own hands by getting some morale boosting wins. Next up for Omiya is a very tricky away game at Sanfrecce Hiroshima and a meeting with our former player Naoki Ishihara, who is playing so well for 2nd placed Hiroshima. Another tough game for Verdenik as he looks to quickly get some points on the board.